This mod adds customizable slopes, stairs, slabs, barriers and gates to the game! Have you ever needed stairs that matched a particular block? Or, have you ever wanted grass or snow to cover blocks besides dirt? This mod makes all this and more possible. Originally created as a successor to Kaevator's SuperSlopes, this mod has expanded to include not only dozens of slopes, but also shapes you're all familiar with: stairs, slabs, walls, fences and gates. Plus, I've added several variations of my own to enliven your game as much as possible. Picket fences, walls as high as you want and more await you! Want lighted glowstone walls? No problem. Need snow covered obsidian slopes? Piece of cake. Want leaf covered stairs? Sure, why not! Want to make redstone activated two-high gates? Absolutely, it works great! Want to make your own Luxor Hotel? With the pyramid top and 44 other slope types, it's simple! 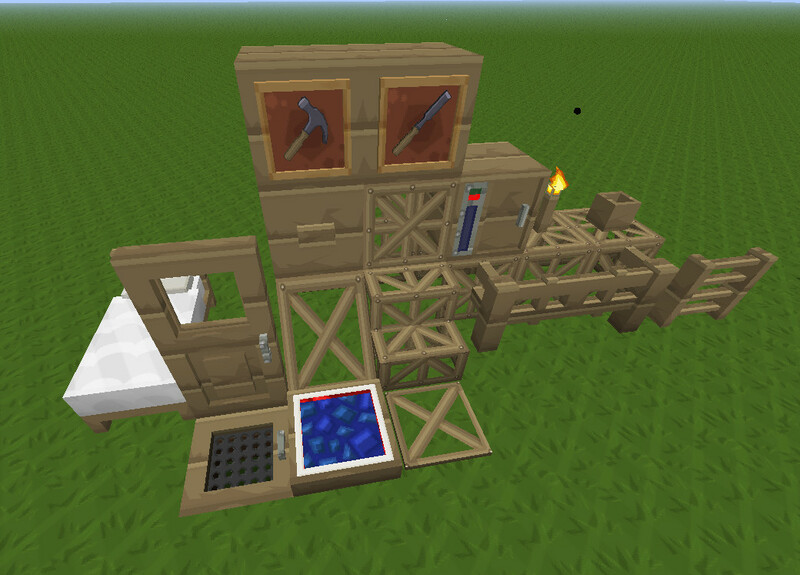 Make sure it is ABOVE the main Carpenter's Blocks patch in your Resourcepacks setup! Original scaffold texture from IC2 by ruyan and Amon that these textures are based from. Just to let you know it's updated to MC1.6 recently. Other than the file structure changing there's quite a few new textures. HanFox wrote: Just to let you know it's updated to MC1.6 recently. Just got back from vacation. I don't have any 1.6 versions installed to test it yet so if someone wants to convert it to the 1.6 structure I'll add it to the OP. I asked in the mod thread and nobody seemed interested to do it. I'm fairly active with the mod so unless i'm super busy with work, any updates should be somewhat quick to push out. I should be able to have the updated textures done soon, though it may take some time to get the overlays to look right. Hello, Just want to say that I love the work you've done on this. I've converted the structure to the most recent 1.6 release of the mod and resized for 32x packs. I'd post links now but I need to fix something I had changed as an experiment. I also made my own chisel texture and glass textures for the door and trap door, however I work in 32x so it's not to detailed. I did full on the doors and trap doors. Resturctured packs (and x32 resize): I put in the unmade textures and their folders for reference of what goes where. The sunlight detector texture was removed from the mod itself so I removed it from the packs since it didn't have anywhere to be placed. Also if you ever need a texture resized to smaller, my editor program does pixel resize without the fuzzy effect around the edges. Yeah with work I've not had a lot of time to update the pack. The 1.6 structure will be very useful to help me do it correctly. I had an idea of the structure due to looking at the 1.6 version mod, but wasn't sure if I was meant to go from assets or somewhere else. Hopefully i'll have some time this weekend to work on it. Yeah that's all I have at the moment. Feel free to make 128x textures and I can scale them down to lower resolutions as needed. c_death wrote: Yeah with work I've not had a lot of time to update the pack. The 1.6 structure will be very useful to help me do it correctly. I had an idea of the structure due to looking at the 1.6 version mod, but wasn't sure if I was meant to go from assets or somewhere else. Hopefully i'll have some time this weekend to work on it. Heh, yah it took me a bit to figure out that the mod named folder just goes in the assets folder of the sphax pack and not into the minecraft sub-folder.... ok, that is the worst explanation i've ever tried to do lol. Glad I could help. Hope you get some free time. Likely will need help with overlays. Testing now, will make a release without updating the overlays. Anyone that can help with those and have them look right would be appreciated. edit - testing has run into problems. None of the textures will display and I can't tell if it's a problem with my textures or my minecraft being dumb. Will post the files once I correct the issue. Care to be more specific? 1.5 of what? Minecraft? The mod? What doesn't work about them? How are you installing them? Where are you putting the textures? I'm not a mind reader, you need to provide details if you want help. Oh, the pathing has changed for the mod. Stairs and Slopes now have their own subfolders in the main block texture folder.